Japanese traditional textile and fabric dyeing is an art that is heavily reliant on the visual perception of color—and if there ever was such a thing as a color master, Sachio Yoshioka would be that person. Yoshioka is a fifth-generation artisan of Japanese traditional dyeing whose expertise in both dyeing and colors has even been called upon by top cosmetics and fashion brands to assist in the development of new products. He spent his childhood watching his father and grandfather work as traditional dyers, and while his interest in journalism led him to study literature, he decided to continue his family’s tradition and become the fifth generation artisan in his family's someya, or tradition of textile dyeing. 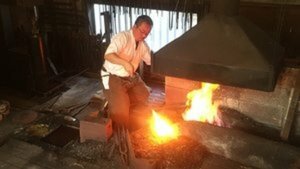 On a hot summer day, we were invited to a gathering of Master Yoshioka’s close friends at his atelier to enjoy a meal of salt-grilled ayu (鮎, Japanese sweetfish), a dish traditionally served at the beginning of summer. On a later day, we were privileged to receive the opportunity to interview him and learn more about his traditional craft of dyeing and his deep knowledge of colors. Yoshioka clarified that traditional organic dyeing has changed over time, and in his opinion, it has become less suitable for modern society. He elaborated that the Japanese method of organic dyeing requires clean water, space, and most importantly the correct natural ingredients. It's a process that involves extracting pigments from natural materials, though finding ingredients that will produce the right pigment is a time-consuming undertaking. In a society where instant gratification has become the norm, this process might be overlooked for cheaper and synthetic alternatives. However, Yoshioka made a point that he isn’t necessarily continuing the tradition of dyeing to preserve the art; he believes that using natural dyes and pigments can create the most beautiful colors in the world, and he strives to recreate this beauty. At one point in his life, Yoshioka said he used to travel an average of twice a month to gather new information as well as search for new natural ingredients for dyes. “The world around us is what inspires us to find a specific color to dye,” he said. Yoshioka explained that seeing natural, unaltered colors is so important, yet something that our modern society has seemed to neglect. Living in a digitized world where the colors of images and videos are enhanced and altered with the click of a button, we are left with nothing more than artificial colors and screens filled with pixels. When many people (including Japanese) think of Japanese colors, it is not uncommon to hear descriptions of “subdued” and “earthy,” and the term “wabi-sabi” often comes to mind – accompanied by images of rustic tea bowls filled with matcha green tea. Yoshioka elaborated that although Japanese colors are often portrayed as reserved and simplistic, there are two sides of the spectrum, and that before the grays and browns of "wabi-sabi" came a history of bright colors. Yoshioka explained that many dyeing techniques as well as various natural ingredients were imported to Japan from the outside, and there are records of rare ingredients including a plant called sappanwood (known as su-ou, 蘇芳) being imported from abroad. The extent to which Japanese people went to import ingredients just for dyeing gives us an idea of how important colors were regarded by the Japanese during that time. Accounts of colors during the Nara (710~794) and Heian (794~1185) periods described them as bright and colorful, which Yoshioka believes is a side of Japanese culture that seems to be forgotten today. Yoshioka explained that the Edo period (1603-1868) was a time when those in power, the Tokugawa Shogunate, restricted the lower classes of peasants, craftsmen and merchants from wearing extravagant clothing and bright colors—which were reserved for those at the top of the social hierarchy. As bright colors were replaced with blends of grays and browns, the spectrum of colors worn by the masses shifted to less saturated versions of their former brilliance. This shift was later seen when the Mingei Movement (民藝運動) took place in the early 1900's, and there was a surge in the appreciation of hand-made folk art utilized in everyday life. Yoshioka admitted that although the dyeing techniques and variety of colors found today are nowhere near as sophisticated as they once were during the Nara and Heian periods, he is determined to rediscover those colors. He emphasized numerous times about the importance of studying old literature, such as the "Tale of Genji" (published around 1021) and the "Manyoshuu" (oldest collection of Japanese poetry). He explained that by taking the time to do research, you learn invaluable information about different techniques and tricks to extracting dyes, as well as how people wore and perceived colors during those times. By reading the ancient Manyoshuu text, Yoshioka explained, one will notice that at that time colors were already being referred to by specific names—names that were evocative and often served as another way of enjoying the color. Kakitsubata (iris). Sakura (cherry blossom). Kikyou (bellflower). Although the flowers themselves weren't specifically used as ingredients to dye, their names suggest certain colors. He noted that these colorful names didn't only reflect the Japanese's enjoyment for colors, but also an appreciation for the seasons. This appreciation for the seasons encompasses colors, patterns, materials, and cuisine, and since that time, the ability to recognize and appreciate these seasonal motifs has indicated a person of cultural refinement in Japan. Yoshioka explained that this appreciation for the seasons was a pivotal stepping stone in the development of Japanese culture. From seasonal festivals to daily meals, Japanese people still find a way to enjoy the changing seasons to this day—the fresh salt-grilled ayu we enjoyed when we met Yoshioka reminded us of this. Similarly, just as washoku (Japanese cuisine) allows us to enjoy the changing seasons, so should colors. Along with his daughter Sarasa Yoshioka, sixth-generation artisan of traditional dyeing, Master Yoshioka continues his search for the lively colors that filled the past, further inspiring us to hold onto the bright culture that Japan’s organic dyeing tradition has contributed to for centuries.